The Internet is running out of IPv4 (Internet Protocol version 4) addresses — a computer’s unique address on the Internet. It’s just become harder to get IPv4 addresses. IPv4 Exhaustion Gets Real. Is this the end of IPv4 addresses? 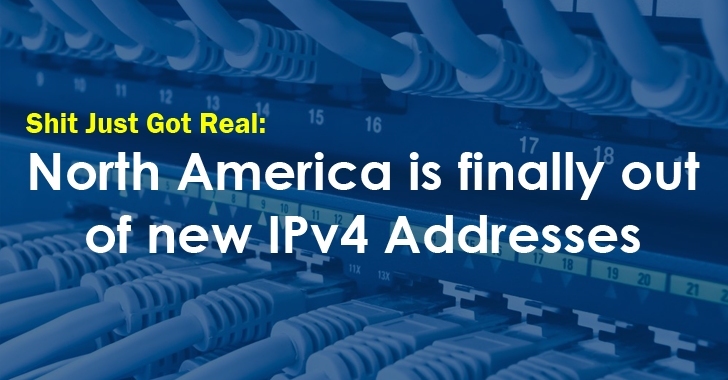 Finally, North America ran out of iPv4 addresses and officially exhausted its supply of IPv4 addresses, joining Asia, Europe, and Latin America. The American Registry for Internet Numbers (ARIN), which is responsible for handing out Internet addresses, has warned that it is unable to fulfil a request for the allocation of large blocks of IPv4 addresses due to IPv4 Exhaustion of available address pool. On Wednesday, ARIN activated an "IPv4 Unmet Requests Policy" for the first time and placed a waitlist for companies that request blocks of IP addresses for their services. Is it time for organizations to begin thinking about Migrating to IPv6? The businesses were forced to move to the updated IPv6 address ever since 2011 when IPv4 had an available pool of 4.3 Billion addresses, before officially running out of unallocated addresses in the US in 2014. IPv4 Exhaustion would cause trouble for the growth of the Internet and the next 20 Billion Internet-of-Things devices would struggle hard to become a reality unless IPv6 addresses are widely adopted soon. IPv6 was invented in about two decades ago in 1998, and it features much longer addresses, such as — FE80:0000:0000:0000:0202:B3FF:FE1E:8329. This simply means that IPv6 will offer a total available pool of 340 Trillion Trillion Trillion addresses, providing capacity for a very long term. According to recent stats provided by Google, around 7 percent of Internet is using IPv6, which is increased by 2 percent from last two years. Belgium and Switzerland are the leading countries with the highest adoption of IPv6.